RB Melvin Gordon vs. LB Brandon Marshall – Melvin Gordon’s exceptional play in 2016 earned him an 83.0 overall PFF grade, ninth best among all qualifying running backs. When he gets past the Broncos’ defensive line, he’ll have a challenge on his hands when matched up with Brandon Marshall. Marshall’s 84.4 overall PFF grade last season ranked him 14th among 171 qualifying linebackers. He had 28 tackles in 2016 and missed just one on 258 run snaps, but he did allow opposing running backs a decent amount of extra yardage on those tackles; his 6.2 run stop percentage was tied for 51st among 60 linebackers to play at least 124 run snaps. 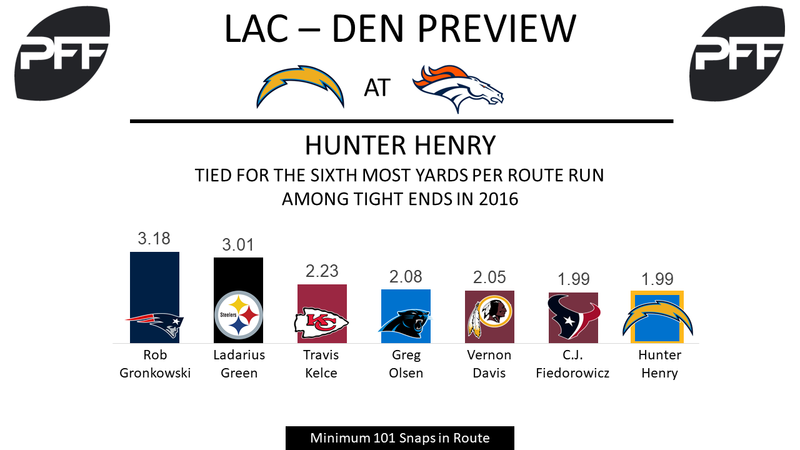 TE Hunter Henry vs. LB Todd Davis – The Chargers will look to get Hunter Henry matched up with a linebacker as often as possible. Henry had a catch rate of 80.0 out of the slot last year, the sixth highest percentage out of 32 tight ends with at least 175 routes from the slot. When Henry lines up to on the right side of the offensive formation, Todd Davis is likely to be a frequent defender. Davis earned an above-average 75.9 overall PFF grade last season, but struggled on coverage assignments. His 1.88 yards per cover snap was the highest mark among 57 linebackers with at least 156 snaps in coverage. WR Keenan Allen vs. CB Chris Harris Jr. – Keenan Allen put together an impressive first half of the 2015, and his 2.17 yards per route run were tied for the 13th most among 85 wide receivers to with at least 48 targets on the year. Monday’s game will be his first regular season action since tearing his ACL in the first game of the 2016 season. Allen most often lines up as a left wide receiver, so he’ll be challenged by Chris Harris Jr, who plays the vast majority of his snaps on the defense’s right side. Harris Jr. earned a 91.6 overall PFF grade last year, the highest grade given to a cornerback in 2016, and his 0.66 yards per cover snap were the second fewest allowed out of 117 cornerbacks with 177-plus snaps. T Garett Bolles vs. Edge Melvin Ingram – The Broncos’ rookie left tackle will take on one of the best pass-rushers from a season ago in this Week 1 matchup. Last season at Utah, Bolles earned a grade of 86.0, which ranked 21st of 315 qualifying tackles. Ingram accumulated 38 total pressures rushing from the right side last season, third most among all 3-4 outside linebackers. With 65.6 percent of Ingram’s total pass rushing snaps coming from the right side, Bolles should expect to see plenty of opportunities to prove himself against one of the NFL’s best. WR Demaryius Thomas vs. CB Casey Hayward – Thomas will likely see a lot of coverage from PFF’s sixth highest grade cornerback in 2016 (88.4 overall grade). Hayward allowed a passer rating of just 53.4 when targeted last season, the third lowest rating among all cornerbacks (minimum 175 snaps). Meanwhile, Denver quarterbacks had a 93.2 rating when targeting Thomas last season. 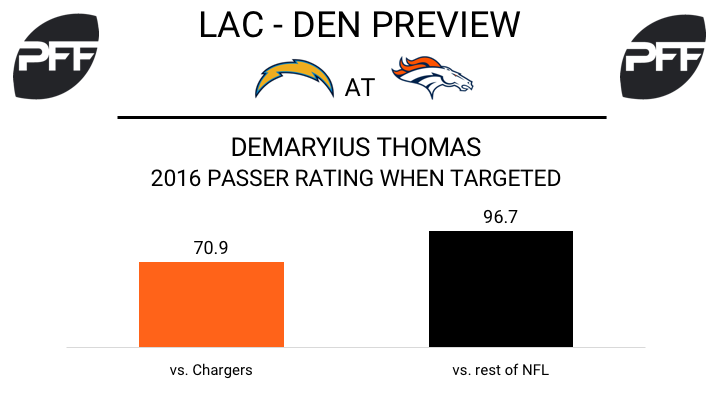 Thomas’ lowest graded game came against the Chargers in Week 6 of last season; he will see if he can get the better of them to start 2017.